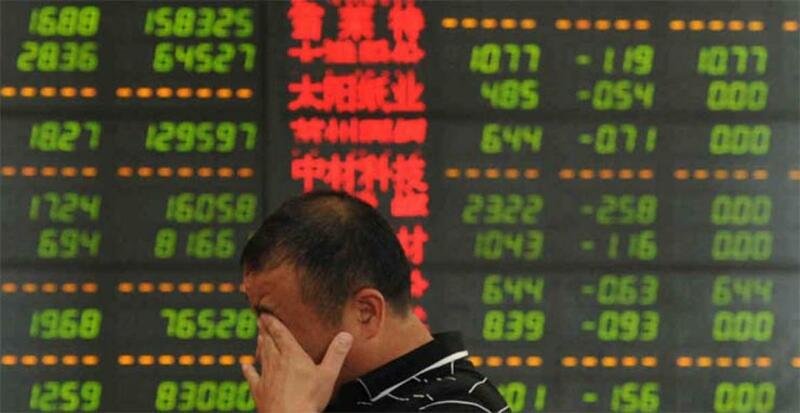 Chinese stocks continues to fall on Tuesday, following an 8.49 percent loss on Monday, a media report said.The benchmark Shanghai Composite Index fell 7.63 percent to 2,964.97 points, following the 8.49-percent loss on Monday in its biggest daily slump since February 2007, Xinhua news agency reported. The Shenzhen Component Index lost 7.04 percent to close at 10,197.94 points. Nearly 2,000 shares fell by the 10-percent daily limit, including even Sinopec and PetroChina -- two heavyweight shares that have long acted as a kind of market ballast, stabilising the market in times of crisis. Japan's Nikkei 225 Index dived 3.96 percent to close at 17,806.7. Overnight, The Dow Jones Industrial Average tumbled 3.58 percent to 15,871.28. The S&P 500 lost 3.94 percent and The Nasdaq Composite Index sank 3.82 percent. European equities also dived on Monday following the previous session's steep decline, as the Stoxx Europe 600 was down over 6 percent and Germany's DAX fell 4 percent. However, they rebounded at the start of trading on Tuesday. The FTSE 100 rose 1.6 percent to 5,994.11, while Germany's Dax and Paris Cac were both up about 1.4 percent, BBC reported. The losing streak in China came despite the government's decision on Sunday to allow pension funds to invest in the stock market. The move came earlier than expected and with the obvious purpose of shoring up investors' confidence and stabilising the market. Under the new guidelines, up to 30 percent of the pension fund's net assets can be invested in stocks and equities. The fund has assets of around 2 trillion yuan ($326.8 billion) that could be invested, meaning up to 600 billion yuan could theoretically go into the stock markets. Weak economic data dealt with another blow to investor confidence. The Caixin flash China general manufacturing PMI, the earliest available indicator of manufacturing sector conditions in China, retreated to 47.1 in August, the lowest reading since March 2009. The continuous fall in the index in recent months indicates the economy is still bottoming out, said He Fan, chief economist at Caixin Insight Group. The root cause for the global rout is a "stimulus without reforms" approach seen in all economies, according to Ren Zeping, an analyst with Guotai Junan Securities. Since the global financial crisis in 2008, countries have invariably resorted to convenient monetary and fiscal stimulus measures without carrying out any genuine reforms, the analyst said. Ren added that such equilibrium with countries taking the same loose policy stance may have come to an end as countries with bright economic prospects are now poised to tighten their monetary policies while countries facing major economic headwinds would rather keep the monetary policies on the loose side.